Sometime early last year I was either browsing my favorite book related blogs or looking on Amaxon.com for their list of recommended upcoming releases when I came across a book called Rosemary and Rue by Seanan McGuire. The back cover blurb caught my eye with the mention of a half Sidhe-half human Private Investigator, October Daye, who had lost 14 years of her life. At first I thought the 14 years were the price she had paid for working some magic spell. Boy was I wrong. Instead of paying a price, she was unwillingly transformed into something other then human or fae and spent those 14 years unable to sense or comprehend the passing of time. Intrigued I picked up a copy when it was published and Ms McGuire sucked me into a dark, complex enjoyable tale. When The Bookpushers were contacted to see if there was interest in reviewing her upcoming book called A Local Habitation that just happened to be the sequel to Rosemary and Rue, I leaped on the chance. Per the FTC I am obligated to inform you that I received an ARC of this book from the author for the purpose of reviewing it. (Confidentially I will admit that I will purchase a copy release week.) I will attempt to avoid major spoilers from Rosemary and Rue but some smaller ones are inevitable. “Half-human, half-fae, outsiders from birth, most changelings are second class children of Faerie spending their lives fighting for the respect of their immortal relations. Toby is the only changeling who has earned knighthood, and she re-earns that position every day, undertaking assignments for her liege, Sylvester, the Duke of Shadowed Hills. Ms McGuire has succeeded in taking a common theme, the Sidhe, and adding some unique twists that sucked me back into October’s life. Set once again in San Francisco, home to October “Toby” Daye, the opening scene showcases Toby in a much lighter mood then than readers of the first book are accustomed to seeing. Fans of this series might also be interested in the fact that we also get to see Tybalt, a very powerful Cait Sidhe and the local King of the Cats *waggles eyebrows* very early on. Don’t worry I promise you that Tybalt appears again. Throughout the course of Toby’s investigation in A Local Habitation, I was treated to more information about the Sidhe culture, its various members and Toby herself. I found it to be a mark of Ms McGuire’s skillful writing style that her character and world building were seamlessly merged with the pace of the story so I never lost my reading enjoyment as the story unfolded. All of the characters showed unexpected depths, including those victims who died before Toby arrived at Tamed Lightening. Based on the other characters statements about one of the victims I had painted a particular picture but when Toby examined their office area my mental picture drastically changed. In another instance I thought I had figured out who one character was attracted to and found I was entirely wrong. Toby and her sidekick (name is a major spoiler for Rosemary and Rue) also learned some interesting lessons and faced some situations when Toby’s connection to her liege wasn’t necessarily believed or even helpful. The murder mystery was complex enough that while I guessed some of the roles the different characters played I was not expecting all of the twists nor did I accurately guess the culprit. Despite the gritty nature of the investigation, Toby and the cast of assorted characters do experience some lighter moments. Ms McGuire’s October Daye series does not shy away from showing how the Sidhe have a very different viewpoint on life and what death really means. I also got to see the manifestation of power and what it means to have and control that power. While dark and gritty A Local Habitation ends on a note of hope. 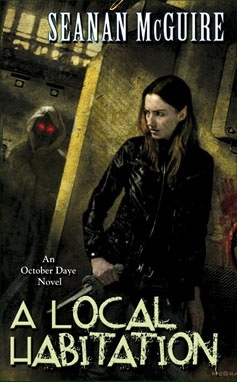 I enjoyed reading it and look forward to the next installment in October Daye’s life, An Artificial Night. Ms McGuire has very kindly provided the reader with a sneak peek of into that third novel due to release in September 2010. I give it a rating of 4 of 5 five stars for the slight predictability in some of the characters and their roles and the fact that I believe in order to fully enjoy the book and understand at least one key scene you need to read Rosemary and Rue. A Local Habitation releases in North America on March 2 as a DAW Mass Market Paperback. Great review! I completely agree about this author’s world building. Glad to hear it continues to be a strong point in the second book. I agree with that plan! LOL I am sure you will enjoy it. Glad you liked the review. The book sounds really good!! !